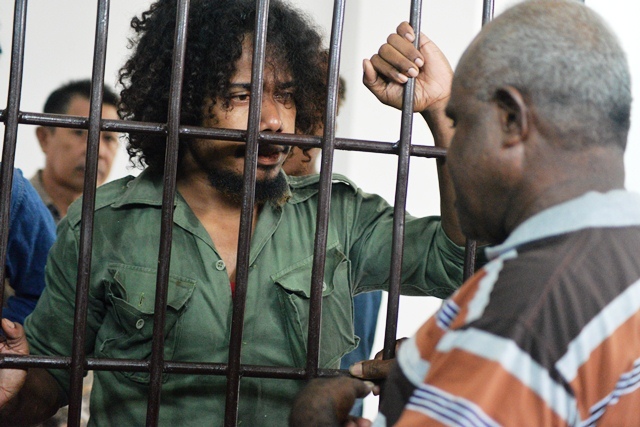 As the year draws to a close, we would like to give an update on the situation around West Papuan political prisoner Yanto Awerkion who was arrested on 30th May 2017, simply for speaking at an event supporting the historic West Papuan People’s Petition which in total was signed by over 1.8 MILLION people, including 70% of the indigenous West Papuan population. He is facing possible charges of “treason” which carries a 15 year jail sentence. On 30th May, West Papuan people held a peaceful prayer gathering in the town of Timika and as local Deputy Chairperson of the West Papua National Committee (KNPB), Yanto Awerkion took to the stage to announce to the eager crowd the incredible news that in their region of Bomberai, 267,437 signatures were collected. As soon as he took to the stage, the Indonesian troops raided the compound. They were fully armed and made up of the Indonesian military, police, Detatchment 88 (“Anti Terror” troops), Kopassus (Special Troops) and Intelligence Services. As the West Papuan people sat calmly on the ground and sang hymns peacefully, the Indonesian troops tried their worst to create violence and provoke the crowd by being as aggressive as possible. They smashed the gate and tore through the compound, raiding the headquarters and confiscating everything including clothes, flags and banners calling for self-determination and an Internationally Supervised Vote (referendum) on independence. Yanto was arrested and has remained behind bars ever since. He was held for 5 and a half months (169 days) without trial until his first court appearance on 15th November. For months, his health seriously deteriorated an he experienced headaches, fevers and respiratory disorders, given only 2 meals per day with little light. 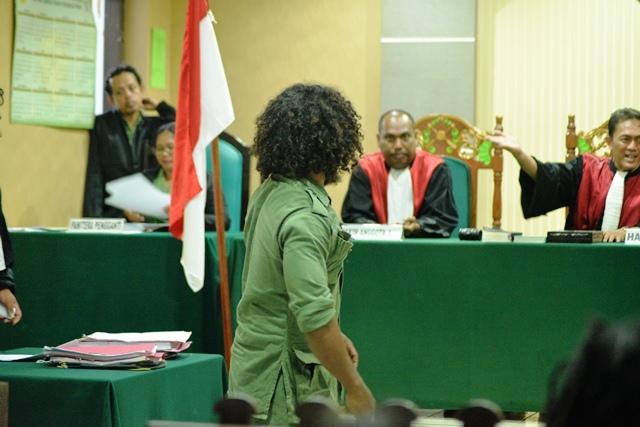 According to the KNPB, Yanto’s first court case was safe and proceeded without complications, although there were armed Indonesian police outside. His next two court cases took place on 22nd November, 29th November and 12th December with little progress and now his nearest court case is set for 9th January 2018. We are preparing to take urgent action to ensure that Yanto Awerkion gets unconditionally released from custody as soon as possible. In the next few days we will be in touch so please do watch this space and get ready for the push to #FreeYantoAwerkion! Meanwhile in West Papua as a whole, the human rights situation continues to deteriorate and there are more and more reports of ongoing human rights violations including unlawful arrests, torture and kidnappings and killings of peaceful West Papuan activists by the Indonesian military and police. 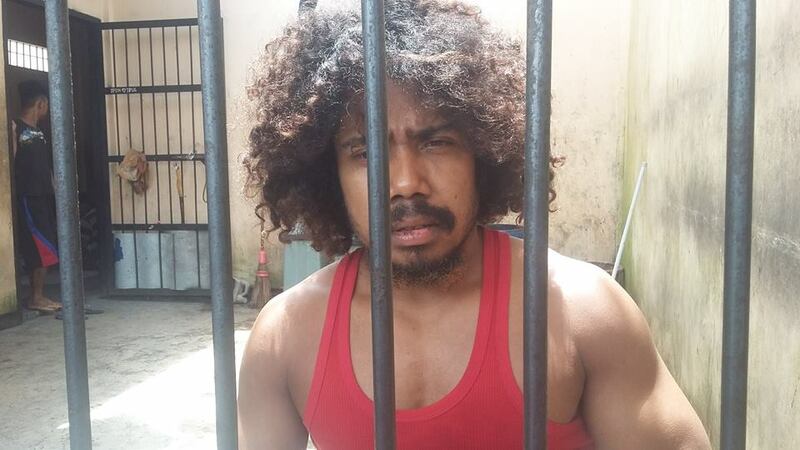 We send our solidarity and strength with Yanto Awerkion and all political prisoners in West Papua who continue to suffer behind bars, simply for speaking out for their rights to be free.